In Part 1 on Soft Goods, we discussed the basics of the technical clothing that is needed to venture into the backcountry, as well as the importance of selecting the right pieces. Backcountry ski touring and snowboarding (splitboarding) has seen a huge increase in popularity in the last decade, and more companies are offering new and advanced products each year. Next, we will look at the various pieces of equipment that make up the Hard Goods, and what makes them different from an alpine or resort set-up. The word “set-up” refers to the combination of skis/snowboard, bindings and boots, and can be used to describe both resort and backcountry equipment. The term “hard goods” typically refers to gear and equipment instead of clothing and accessories, and can be broken down into Skis/Splitboards, Boots, and Bindings. 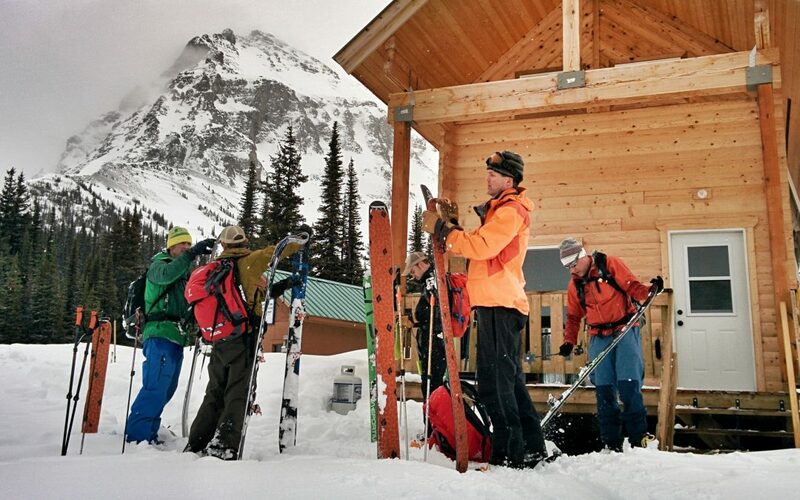 Although similar in appearance to resort set-ups, backcountry gear set-ups have many unique features specific for travelling through backcountry terrain. The biggest differences between resort and backcountry skis and snowboards comes down to weight and shape. Generally, a resort set-up is intended to be used on groomed and hard-packed snow, and some occasional powder. While a backcountry ski or snowboard is designed towards floating and being buoyant in deep powder and softer snow. 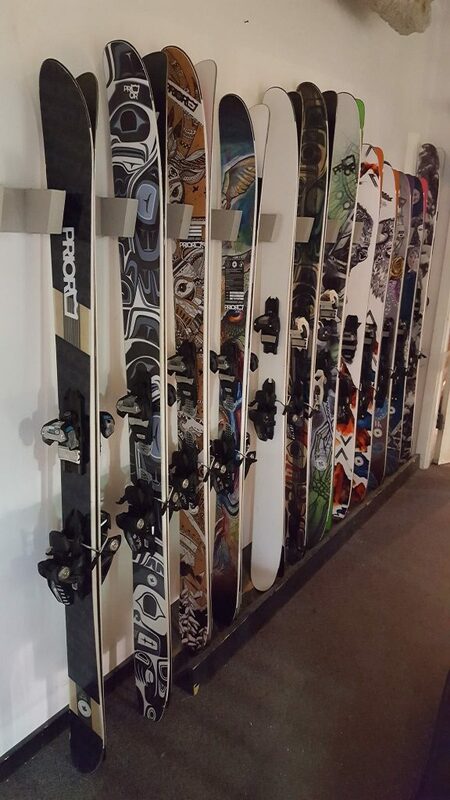 There are of course variations of each, with many skis and snowboards being versatile in a range of conditions. A splitboard is a snowboard that has been designed and manufactured to split into two skis when the rider wants to tour uphill or across flat terrain. When the rider is finished touring and wants to descend, the skis are then put back together to form the original shape of the snowboard and held in place by the binding base plates and a series of clasps. 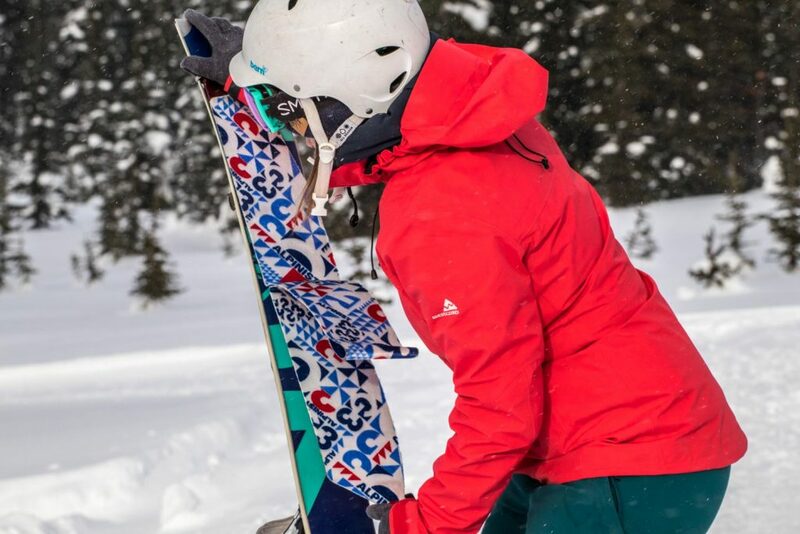 To travel uphill on snow, whether on skis or on a splitboard, you will need to use skins. Skins are a piece of man-made fabric that is stuck the base of the skis to add grip and traction against the slippery snow. With the introduction of carbon-fibre technology, there has been a dramatic reduction in the weight of skis and snowboards. Saving as much weight as possible is crucial to being able to enjoy longer days with more energy. For many years, however, reducing the weight of a ski or a snowboard for going uphill was almost guaranteed to make it less stiff, consequently resulting in a loss of performance when going downhill. Carbon-fibre and other technologies have completely rewritten this rule, where there is virtually no sacrifice between performance and weight. 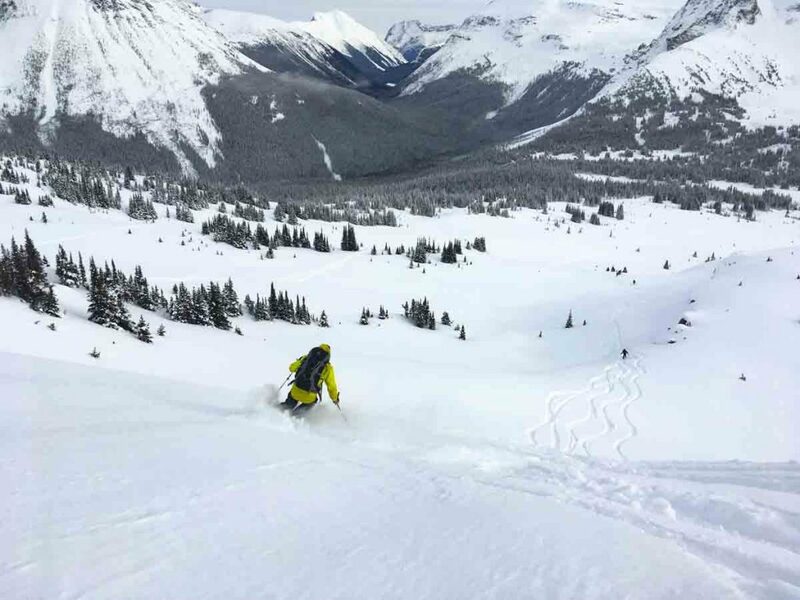 Backcountry skis/boards are now significantly lighter compared to resort skis or boards and yet durable and strong enough to handle most conditions. The shape of backcountry skis and snowboards has changed dramatically in the last decade, with new ideas and technologies continuing to redefine what makes for the ideal shape. Typically, a backcountry ski or snowboard is wider than their resort counterpart, designed to increase flotation in powder. Flotation refers to the ski or snowboard’s ability to stay on top of the snow and is achieved in a number of ways, one of which is increasing the surface area in key zones on the ski or snowboard. In theory, the more flotation you have the easier it is to ski or ride in deep snow. 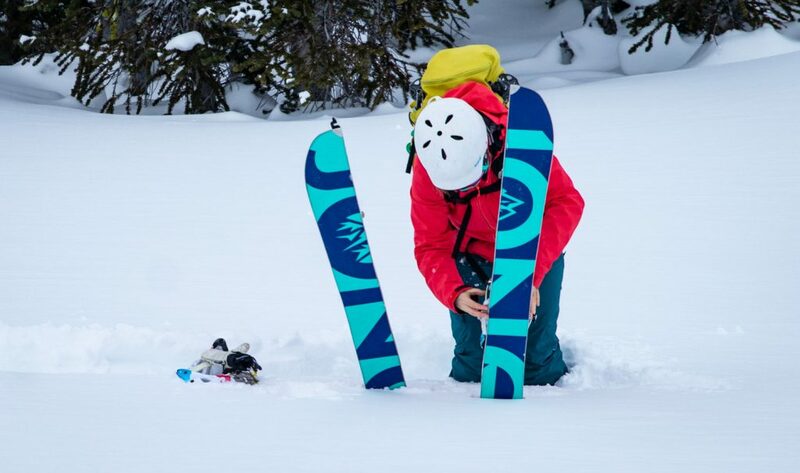 Variations of side-cuts, rocker technology, as well as early rise tips and tails have also continued to change the shape of backcountry skis and boards. A backcountry or ski touring boot looks and operates extremely similar to an alpine or resort boot, with one fundamental difference. 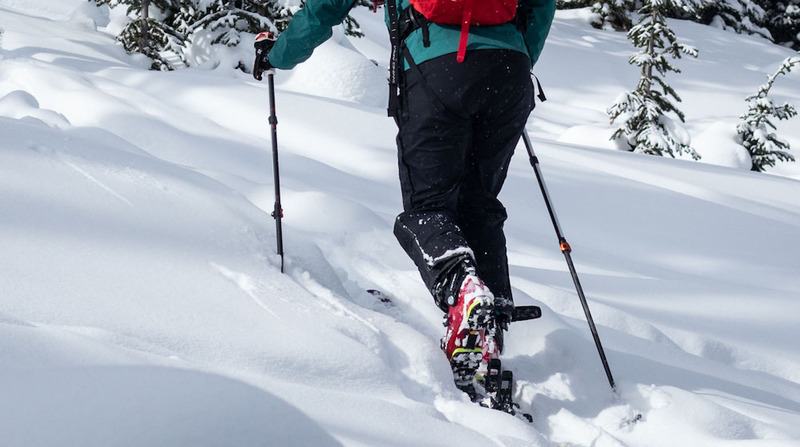 A ski touring boot has a feature called a “walk-mode” that allows for the ankle of the ski boot to be released and articulate when walking uphill. Once at the top, the ankle of the ski boot can be locked back into place, this is called “ski-mode”, transforming it back into a rigid ski boot. Much like ski and snowboard technology, the introduction of new materials into boots, mainly carbon fibre, has dramatically changed backcountry ski and snowboard boots in the last decade. For ski boots, carbon fibre has allowed for a huge reduction in weight, an increase in flexibility when in “walk-mode”, and yet almost no loss of stiffness or performance when in “ski-mode”. For snowboard boots, carbon fibre has allowed boots to become lighter while maintaining stiffness for performance downhill riding and also side-hilling when in traversing in touring mode. Backcountry ski and snowboard boots now perform equally as well as their resort counterparts, yet are significantly lighter for walking uphill. Possibly more important than any other piece of gear, and this stands for both snowboard and ski boots, the right fit in a boot is absolutely essential. More options are on the market than ever before, and time spent trying on as many models and fits as possible is well advised. The right fit will not only increase performance but will ultimately be much more comfortable and warm throughout the course of the day. Similar to ski boots, backcountry bindings for both skiing and snowboarding have a couple major differences from an alpine binding. Backcountry ski and snowboard bindings have a unique feature called “tour-mode”. This means the heel of the binding is allowed to release from the ski or splitboard similar to how a cross-country binding works. Once at the top of a climb, the heel of the binding can be locked back into place and the binding now operates the same as an alpine binding for descending. A special device called a “heel-riser” is also added to assist in making steep uphill travel much easier by essentially reducing the incline of each step. Again, much of the new technology has had an emphasis towards reducing weight and bulk, while maintaining strength and durability. New materials and designs have allowed for lighter and stronger bindings without sacrificing on safety and performance. Many boots and bindings are now part of an integrated system, where each is designed and intended to be used together. There are more options than ever before, and a well-researched plan along with taking the time to speak to knowledgeable staff at local retailers is the best way to know what gear is available and best suited for you. Additionally, as the popularity of many outdoor sports continues to grow, so does the access to used and more affordable gear. Identifying what pieces are essential and which can wait, will help to make purchasing the right gear easier. 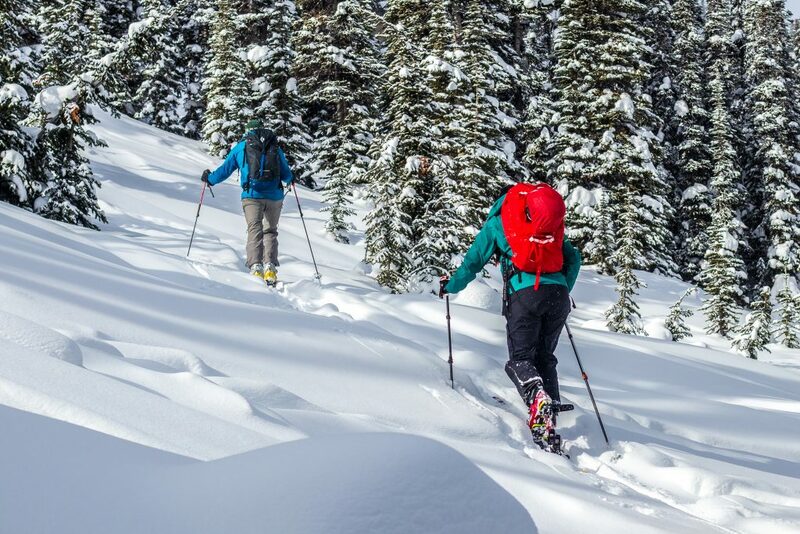 In Backcountry 101 – The Gear Basics Part 3: Safety Equipment will look at the various safety and rescue equipment needed for backcountry travel in the winter.